Thursday, April 30 is Poem In Your Pocket Day. This is a day for everyone to carry a favorite poem around and share it with whomever they meet. Normally, this is a joyous occasion for me and a reason for celebration, but I woke up today with the situation in Baltimore on my mind and with several not-so-happy poems running around in my head. Here are my nominees for poems that need to be in our pockets on Thursday and shared widely. And let us remember that riots do not happen in a vacuum, they are the product of deeply felt and long held hurt. Hurt that cannot be assuaged by too late calls for calm. Poems carry powerful messages and powerful messages are called for on this day. Share a poem, start a conversation, make a connection with others, but mainly think of Freddie Gray and be informed and engaged in the conversation as we try to take lessons from another very personal, and yet very public, tragedy. 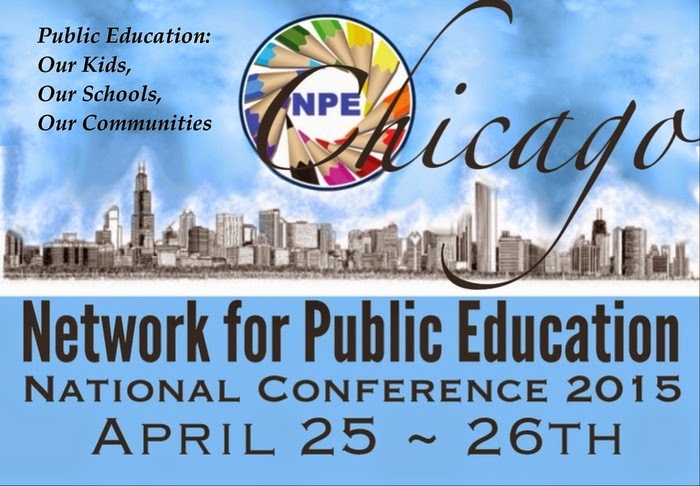 Day 2 of the 2nd annual Network for Public Education opened with a selection of sessions for all interests. I chose to go to the one chaired by my friend and public education hero, Carol Burris. Carol is well known for her advocacy in New York, where she has not only been named Principal of the Year, but has also been a consistent thorn in the side of Governor Cuomo and all education reformers. Carol frequently blogs on The Answer Sheet at The Washington Post. You can check out some of her work on that blog here. Carol Burris and her colleagues at Schools for Opportunity are trying to change the conversation about what constitutes a good school. Rather than focusing on test scores as a definition of excellence, Schools of Opportunity seeks to look at a broad based picture of educational excellence and to reward schools for achievement in overall excellence. Schools of Opportunity looks at multiple criteria for achieving excellence and recognizes schools that achieve this excellence. Their criteria include creating and maintaining a healthy school culture, broadening and enriching curriculum, providing more and better learning time, ending disparities in learning opportunities created by tracking and ability grouping, using a variety of assessments designed to respond to student needs, supporting teachers as professionals and 5 more. This is a group that truly deserves our support as they try to change our definition of excellence in schooling to a broader more nuanced view. Please visit their website here to learn more. The anticipated highlight of the day did not disappoint. 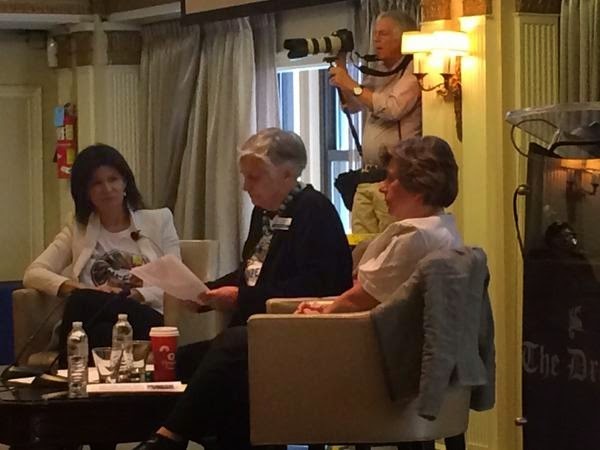 Randi is feisty and political, Lily is quieter, more teacherly, but every bit as skilled a speaker and Diane Ravitch is, well, Diane Ravitch, the hero of the anti-reform movement. It is no secret that many in the room have had their disagreements with the two labor leaders, but on this day, the discussion was mostly a pro-teacher, anti-reform love fest as Lily and Randi pledged to fight for tenure and against yearly testing and even grudgingly agreed to concerns about the Common Core, even if that was couched in the old canard that the problem is really the test. The denouement of the session was reached when Diane asked the two leaders of multi-million dollar unions if they would pledge to refuse to accept money from the Gates/Walton/Broad billionaire reformers club foundations. As the audience held their breath, both Randi and Lily said a resounding, “Yes!” We all hope they mean it and we will all be watching to make sure they follow through. I attended this session with new friends like Steven Singer and Duane Swacker, NPE members who surely have a good book or two in them. Steven has a wonderful blog you should follow called gadlfyonthewall. Steven is a reader of my blog and now I am a reader of his. This is how it works in the wonderful whacky world of blogging to defend public education. Three men who started out blogging and ended up writing books, Anthony Cody, Jose Vilson and John Kuhn discussed the process of going from blog to book. Denny Taylor, long-time champion of great literacy instruction and now a visionary publisher discussed the publishing process, the goals of her Garn Press and plugged Anthony’s book, which she published. Regular readers of this blog will know these three titles from earlier reviews, but in case you haven’t read them yet you should go out and get the following. Vilson, Jose (2014) This is Not a Test. Chicago: Haymarket Press. Former head of the Chicago Teachers Union and the person who undoubtedly would be the mayor elect of Chicago right now if she had not been struck down by serious illness, Karen Lewis, closed the show with Diane Ravitch. It was good to see Karen, looking good and sounding vigorous as she gave credit to others for all the great work she has done for public education and schools. Karen delivered a message of unity and solidarity in the good fight for good schools. Ravitch closed the proceedings by declaring that we will still be here working with and for children after the millionaires and billionaires find another hobby. Russ on Reading would like to thank all the volunteer members of the Board of Directors of the Network for Public Education, Diane Ravitch, Robin Hiller, Anthony Cody, Mark Miller, Darcie Cimarusti, Phyllis Bush, Xian Barrett, Jitu Bown, Carol Burris, Bertis Downs, Leonie Haimson, Julian Vasquez Heilig, Kennet Santana, and Colleen Doherty Wood, for putting on such a wonderful conference and allowing me to be a part of it. Hope to see all of you at the conference next year.